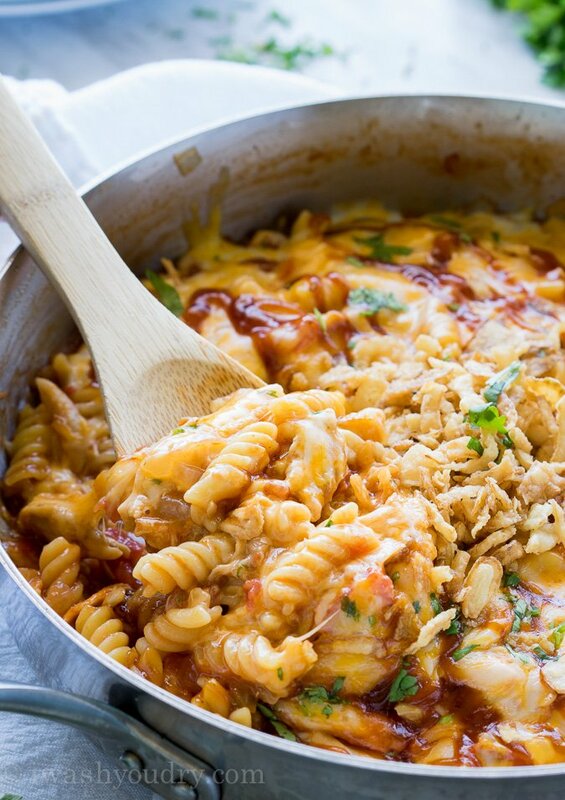 I am completely in love with this BBQ Chicken Pasta Skillet! 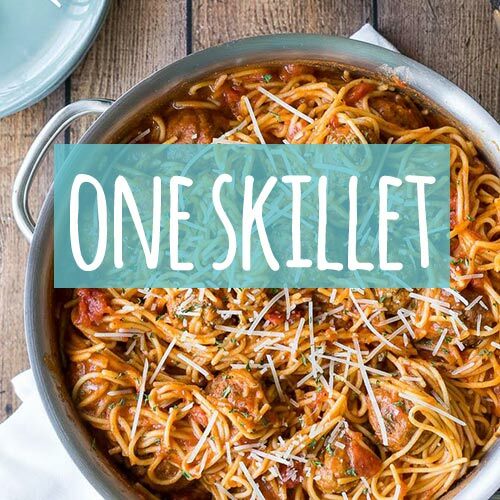 All it takes is just a handful of basic ingredient and one skillet to make this downright delicious dinner! Last year when I was living in Canada I went to dinner at this restaurant called Boston Pizza. They had tons of insanely delicious looking pasta dishes on their menu, and I tried this one that was a pulled bbq pork pasta. It was out of this world! 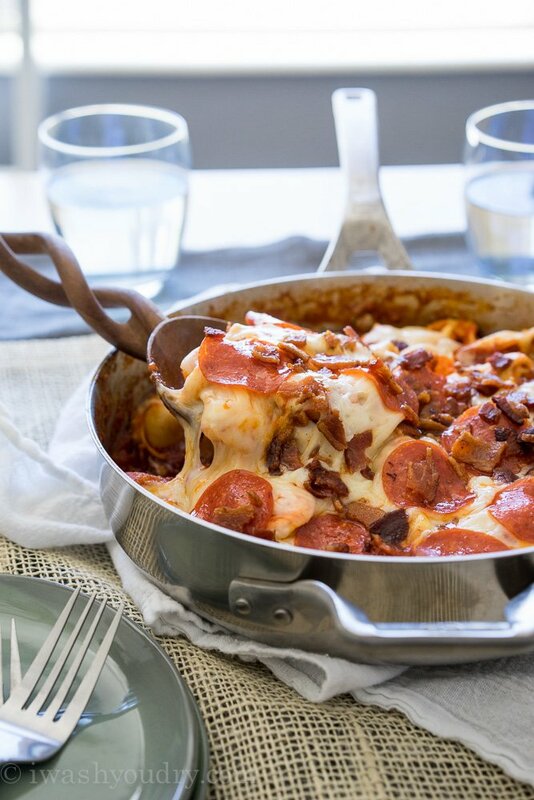 They served it baked ziti style, with a layer of melty cheese and crispy onion strings on top. 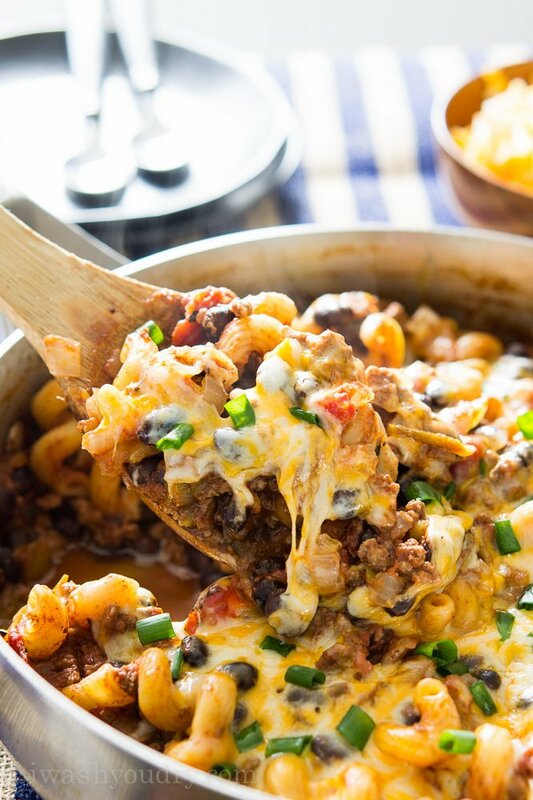 I don’t know why it’s taken me this long to recreate this dish, but here it is… only way better because it’s all made in just one skillet! I opted for a shredded rotisserie chicken, but if you wanted to throw in some pulled pork that would definitely work too! Start by sautéing some diced onion in a little bit of olive oil until it’s tender. Throw in some garlic right at the end and cook until it becomes fragrant. 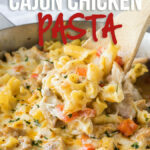 Next just add the chicken, DRY pasta, a can of tomatoes, bbq sauce and some chicken broth! 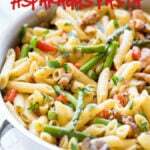 I love this dish because I can just throw in dry pasta! 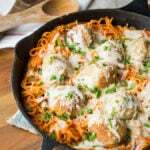 It absorbs all the delicious flavors which really make this dish extra special. 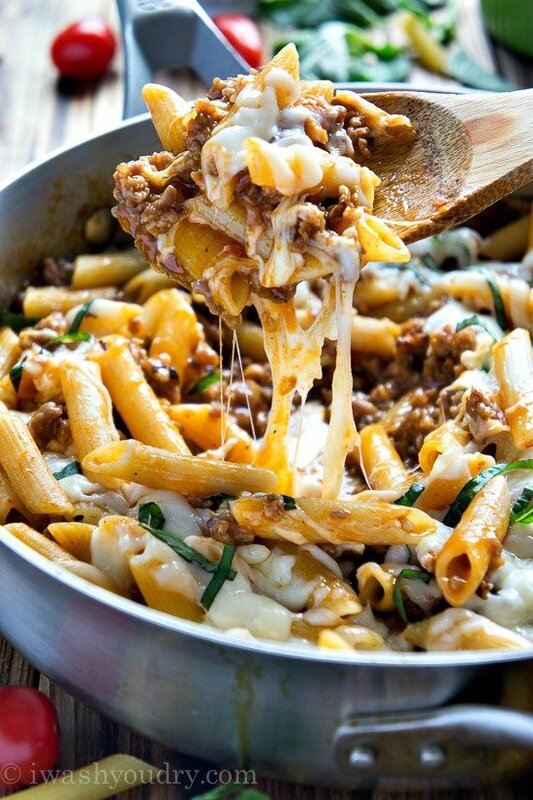 Once the pasta is tender all that’s left is to add the cheese right on top! 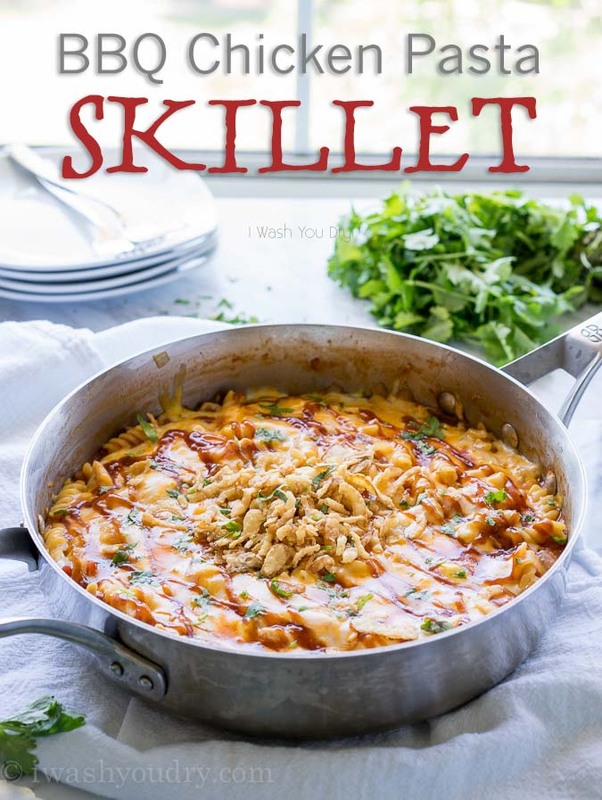 Throw the lid on and let the cheese melt for a few minutes and then top it with another extra drizzle of bbq sauce and some crispy onion strings (I just used the store bought kind), and your dinner is served! My whole family gobbled this right up! The delicious aroma of the bbq sauce and tomatoes is enough to bring the kids in from outside. Seriously! It smells so good! 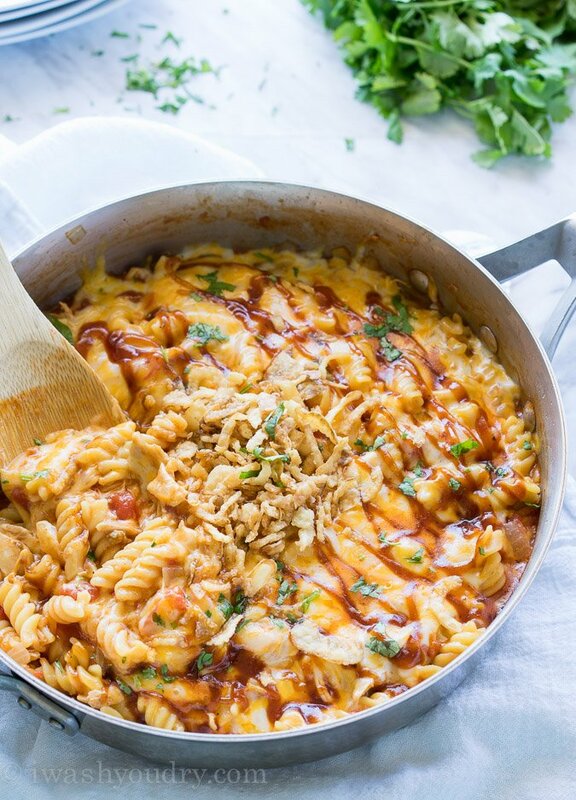 Let’s be real, is there anything better than a cheesy pasta? We’ve already made this several times this past week. 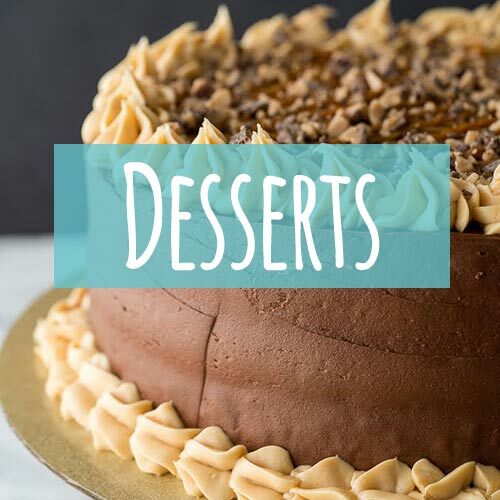 We can’t get enough of it! 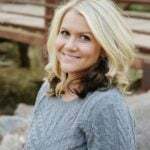 I know you’re definitely going to love this one! 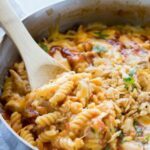 With just a handful of ingredients you can make this delicious BBQ Chicken Pasta Skillet for dinner. Heat olive oil in a large skillet that has a lid with it over medium heat. 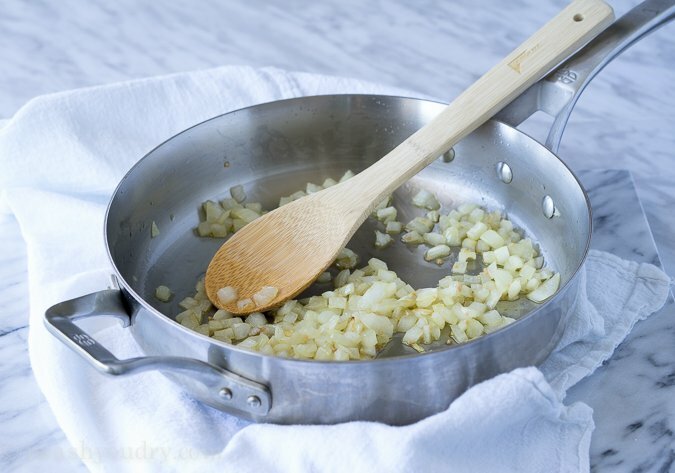 Saute the diced onion until tender, then toss in the garlic and stir until fragrant. 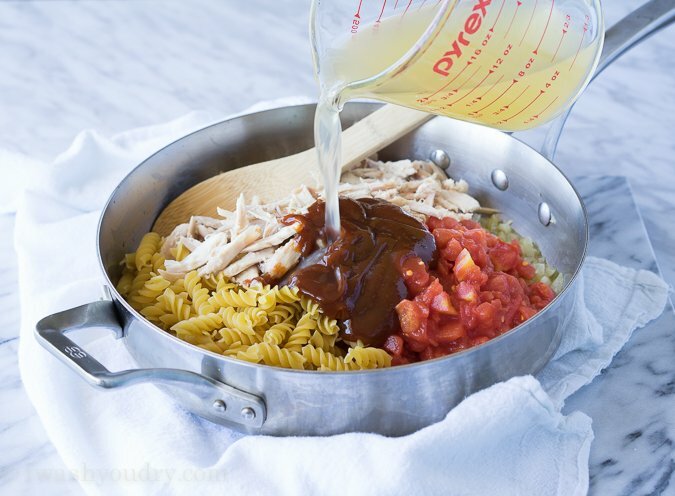 Add the pasta, diced tomatoes, chicken broth, bbq sauce and chicken to the skillet. Stir to combine and bring to a slight boil. 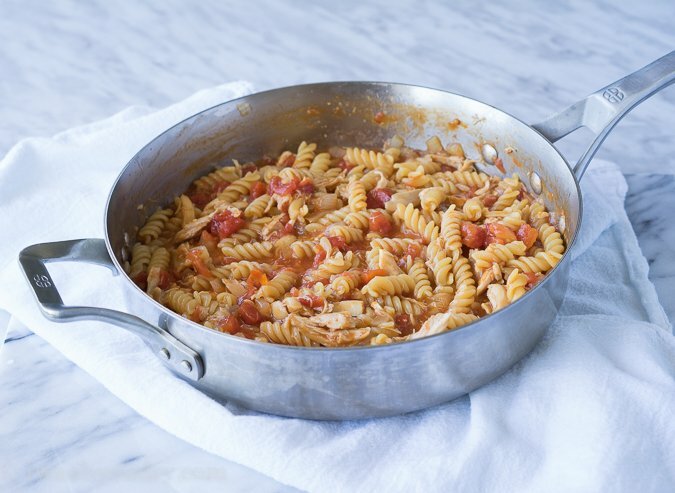 Reduce heat to low and simmer, stirring occasionally until pasta is tender, about 15 minutes. 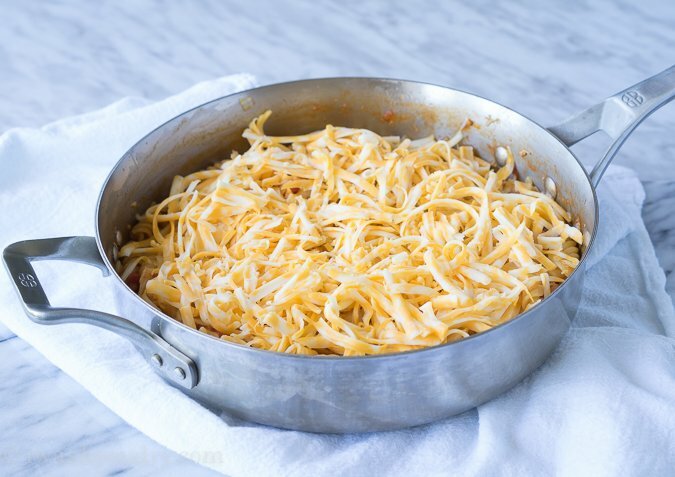 Top the pasta with the shredded cheese and cover with the lid until the cheese melts, about 3 minutes. 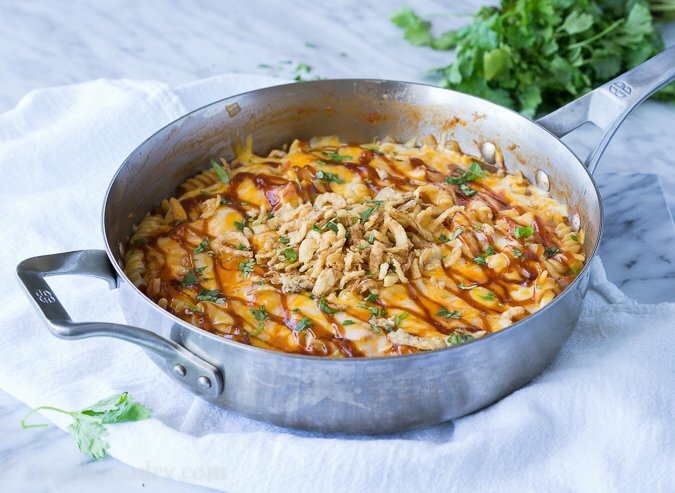 Finish it off with the fried onion strings, a little cilantro and a drizzle of extra bbq sauce if desired. Enjoy! 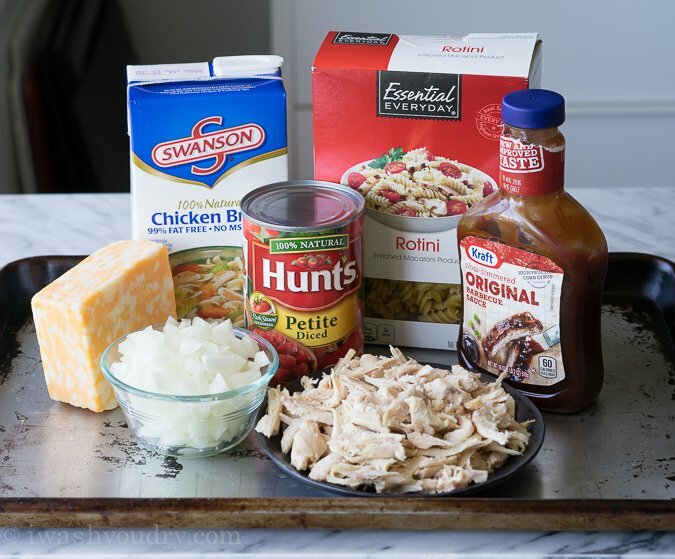 You can substitute pulled pork for the shredded chicken if desired. This was delicious! My family loved it. Will make again! I liked the added touches of the cilantro and fried onions.